To Be Continued… has been covering the discussion going on between C. Michael Patton and Sam Storms over at Parchment and Pen, entitled “Why I am/not Charismatic.” The title comes from Patton, who previously authored a series of eight solo posts with a similar title (“Why I am not Charismatic“). In case we forgot to remind you, we authored a part-for-part response to his series, available here in a single volume. This time around the title differs in terms of a slash, which presumably allows Storms to read it “Why I am Charismatic.” The very title is an example of the power of being able to define the terms. Due to baggage of the word Charismatic, it is not the main term by which Storms self-identifies, though it is the way Patton identifies what he is not. So I’m afraid there is an inherent asymmetry to the discussion, as phrased. Here at round five terminology is still in focus as the topic of discussion is: What are Spiritual Gifts? 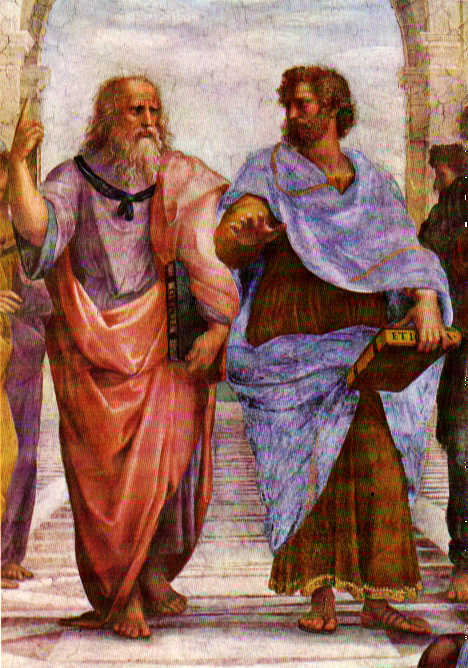 At this point the best way I can characterize the two men’s disparate treatments is to horrendously oversimplify and caracature those two great philosophers of antiquity: Plato and Aristotle. As we see here in a detail from the Raphael’s fresco The School of Athens. At our left Plato points heavenward, while Aristotle indicates the plane of this world, thus illustrating opposing approaches to understanding. Plato moves from the universal to the particular, Aristotle from the particular to the universal. Who is who here? Storms, a la Plato emphasizes the universal, when he points out that however you slice it, “spiritual gifts” are manifestations of the same Holy Spirit. We do not truly grasp the meaning of the particulars unless we begin with this universal understanding. Patton takes Aristotle’s approach (or my cartoon version of it) in working from the particulars to the universal. I am not impartial of course, but I do think this approach less satisfying. One main reason is that the data are not homogeneous. Patton works from four passages each with a list of sorts and applies them all to a single chart. But Eph. 4:11, for example, works differently from the other passages, focusing on different kinds of leaders rather than the spectrum of functions within the church as a whole. Moreover, at any rate, the “gifts” themselves are not really all the same kind of “thing.” They describe the many ways that the Holy Spirit manifests Himself as the Body of Christ does its work, but some–perhaps administration–are ongoing capacities while others–word of wisdom for example–may be the event of a moment. The picture of the whole is more complex than picturing them as something like the different colors in a 24 pack of crayons. In fact, Storms says, do not think of them as “things” at all. They are empowered activities which the Spirit grants to be done through the various Christians who make up Christ’s Body. And how these work, whether one to a customer or ebbing and flowing through the lives of particular believers, or somewhere in between is not as cut-and-dried as often made out to be. My basic thesis here is that Christians already have at least one gift. Individuals do not need to hope they get one in the future. As a part of the body of Christ, the moment anyone becomes a member, they have in their possession the charimata. This statement is problematic in a few ways–mainly grammatical, I’m afraid–and while I always abhor a plural pronoun with a singular antecedent, here it causes confusion: anyone (sing.) has charismata (pl.). I take it he means that one has his or her charisma (=gift). And what does he mean individuals don’t need to hope etc. They can but they don’t have to? They shouldn’t because it is impossible? They can but we shouldn’t encourage them to? Clarity, please. The aspectual force he bases his conclusion on is not at all indicated in this passage. The present tense of these verbs is just as (if not more) compatible with the idea that the Spirit is regularly distributing manifestations of Himself as the Church goes about its life. God “empowers” (energôn, present active participle, v. 6); The spirit “empowers” (energei, present indicative active) and “apportions” (diairoun, present indicative participle) as He “wills” (bouletai, present indicative deponent middle, all v. 11.) These are all presents. Paul is talking about ongoing work, not any fait accompli. He is correct that is more felicitous for his point: each one has received (or each one received) elaben (aorist indicative active). So from this verse we may derive Patton’s point that each believer is gifted from the point of inclusion in the Body. What does not follow is that others are not given later. Affirmation of past actions do not imply negation of present or future ones. Romans 12:6, again, in making an affirmative statement, does not make the negative one Patton wants to draw from it. I simply do not know what to say to Patton’s assertion that the second person plural indicates corporate actions rather than individual. This is wildly fallacious. True, he is addressing the church as an aggregate and not a single individual, but are we to understand, when he says in the next chapter: “Therefore, my beloved brothers, be steadfast, immovable, always abounding in the work of the Lord, knowing that in the Lord your labor is not in vain.” (15:58), that he is exhorting no individual to be steadfast and immovable–or to know about one’s labor individually, but only as a body? It simply is not reasonable. Anyway, does Paul here urge no individual to “pursue love”? It also is in the second person plural. Is this a corporate but not individual mandate? And what about “that you may prophesy”? Do they all prophesy then as a body? In v. 3 an individual is said to prophesy. Or what do we make of v. 5 where Paul says: “Now I want you all to speak in tongues, but even more to prophesy.” How are we to explain this statement–if all gifts have been given at conversion? He is serious about this being a possiblity for any of them, as he states in verse 39: “So, my brothers, earnestly desire (zêloute) to prophesy, and do not forbid speaking in tongues.” What can this mean but that each one is encouraged to prophesy, whether or not that “gift” was given at conversion. But the most telling example is v. 13: “Therefore, one who speaks in a tongue should pray for the power to interpret. ” No question of plural here, or corporate action. Here one with gift A (so to speak) is instructed to seek (through prayer) gift B.
Patton is simply wrong to say that “the church at Corinth, not any individual Christian, should hope for, pray for, and earnestly desire prophecy.” Indeed it isn’t prophecy Paul tells them to earnesty desire, as if to say at least someone in their body, but to prophesy–an individual should desire that he or she would be able to prophesy. He clearly urges every believer to seek to engage in the action of prophesying. And he clearly says a believer can and should pray for particular gifts.